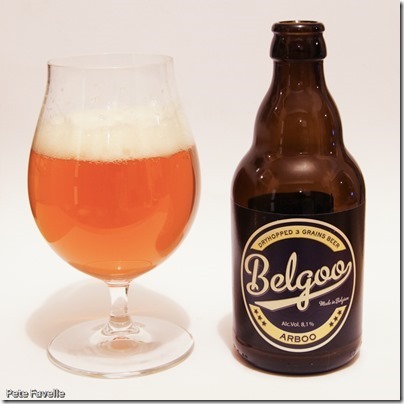 Belgoo beers appear to be produced by Brasserie La Binchoise, who are based in Binche, south of Brussels. I say “appear to be” because neither the brasserie’s website or Belgoo‘s own make any mention of it that I can see. It doesn’t really matter, but I always find it odd when companies are a little vague on who is actually making their product! Belgoo Arboo is an 8.1% ABV blond beer with an interesting recipe – containing not only barley and wheat, but also spelt for good measure. It’s a nice orange-gold colour, with an open textured, slightly fluffy and long lasting white head. The nose is fruity with citrus orange notes and an edge of white pepper, but overall it’s quite understated. The first thing that hits the mouth is a heavy handed carbonation, but underneath that is a sweet, citrus fruit – rather like a liquid marmalade – with a nicely spiced, peppery finish and a definite if faint wheat tang. It’s rich and warming, although it hides its alcohol well. It’s nice, but too fizzy to let its full character show through – 3 stars.